Room is difficult to review. I’ll start out by saying that Room is a good movie and worth your time. Many consider it one of the “can’t miss” movies of 2015, which I understand but don’t necessarily agree. Room, for me, falls under the category of movies that are very well-made but challenging to sit through, sort of like In the Bedroom or Prisoners. Those movies, and Room, are movies I recognize as being terrific in many ways and also movies that I never really want to see again. The experience of watching Room is a drag but any film enthusiast should see it because it may be one of the best movies of the year. It’s just not going to end up as one of my favorites. Room is also difficult to review because to get the most out of it you should know as little about it as possible. For that reason I’ll forgo the normal plot-in-brief and just say the story concerns a mother (Brie Larson) and her 5-year old son (Jacob Tremblay) who live in an enclosed room. To say anything more would be a spoiler, which, unfortunately, most critics have ignored in their reviews; giving away plot developments from as far into the movie as the middle. I understand why they are doing that, because otherwise this movie is next to impossible to critique, but still. The performances in Room are excellent. Brie Larson is solidifying herself as one of those actresses whom you have to see her every movie. She takes chances, commands your attention and makes it all seem natural and easy. Her work in Room might not be as revelatory as her work in Short Term 12 because we now expect her to be excellent, but it’s so great seeing her again in a meaty role where she can really show her skills as opposed to something like The Gambler that has no idea what to do with her. Her co-star (and in many ways the lead of the movie) is Jacob Tremblay, who gives the best child performance I have seen in a very long time. There’s been discussion in the past about why child actors often give great performances and many guess that it’s because the actor is still unaware of what they are doing so they are just “being” this person instead of “playing” this person. That might be the case with Tremblay, but I’m hoping he has a long career ahead of him. As ridiculous as it might sound (because he’s playing a 5-year old in the movie), he reminded me of Joaquin Phoenix at times in Room with his sad features and sensitive expression. It’s a really special performance and helps make whole movie work as well as it does. Room co-stars Sean Bridgers (the dad from The Woman), Joan Allen and William H. Macy, but this is Larson and Tremblay’s movie. Watching Room was an interesting experience. I noticed that I wasn’t being transported by the story and that I was more appreciating it at arm’s length and then I began to think of what choices the filmmakers were making that resulted in that reaction. What I came away with was that Room is much defter as a performance piece than a written piece. I think the screenplay has some problems such an on-the-nose dialogue and easy poetic comparisons (e.g. 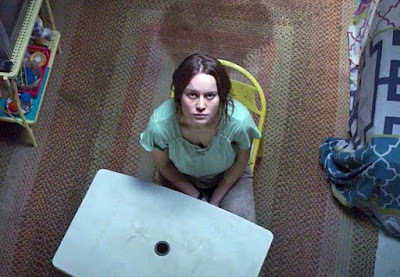 I understand that the plot of Room is similar to that of Alice in Wonderland that it’s about a young girl in a strange place. I don’t need characters to reference that visually or in dialogue). I also think the movie focuses on the wrong lead during the second half of the movie. Larson and Tremblay have equal footing in the first half of Room but then it becomes more of Tremblay as the lead character in the second half than Larson. I was more interested in Larson’s mindset personally, and I feel like the screenplay gives it the short-shrift. I also hated the score for this movie. It pops up inappropriately in two key scenes where having no music would have been better. But those complaints are not deal-breakers when it comes to this movie. You should still see it. 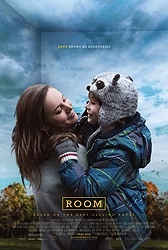 Room was directed by Lenny Abrahamson (Frank) and I’m of two minds about the direction. I think he elicited great performances out of his actors and does a solid job portraying the claustrophobia of being in one small location (he delivers the audience into the situation in a non-fussy way that still preserves the mystery of what is going on) but I also think having a more visually fanciful or creative director for this material may have opened it up a bit. This movie should be a psychological nightmare (something that a David Lynch could bring out) but instead the material is portrayed almost like a play. There’s not a ton of visual invention in Room. I was bothered that the movie is stuck so much at surface level when it should have dug in a little deeper. I feel a little bad now. I’m criticizing a movie I did appreciate very much on the whole. I hope I haven’t dissuaded you from seeing it (I did say it’s a difficult movie to review). 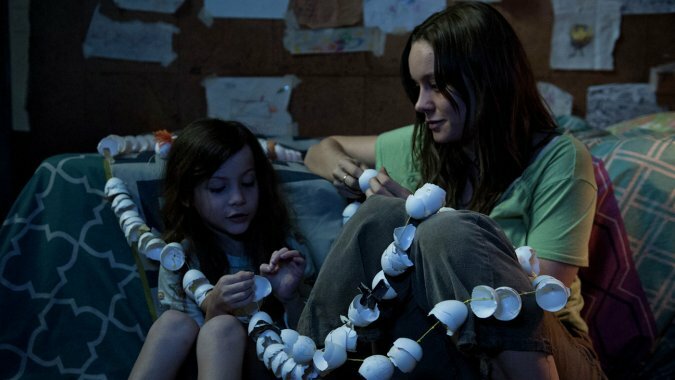 Room is a very suspenseful drama with terrific performances. It’s just not a great movie, because (to paraphrase the words of the great Roger Ebert) those are the ones where I can’t stand the thought of never seeing them again. I wonder if that opinion would be different if I didn’t know what was going to happen during parts of this movie before I saw it. Sigh. Oh well. I guess that’s just a question for the void at this point. This movie sounds super intriguing to me. It sounds like I have the same reaction to prisoners that you do, in that it's a movie that I actually named it my favorite movie of that year, and thought it was really, really compelling and well made...the one time I saw it. Turns out I really don't want to revisit it much. If Room is anywhere near that, I'm sure I'll appreciate it too...the one time I see it. Your review is great though. I've heard good buzz elsewhere, too. I also thinks it's a very good movie that no film lover should miss and no one who has seen it will forget it that fast, but that also nearly nobody wants to sea it again. Maybe it's unfair to say, that a movie with such a story is determined to be only very good and not great... but it is still a great achievement.